It's more than a great metaphor...dancing requires essential leadership skills. A leader who dances has courage, confidence, and creativity...or at least, chutzpah! How does dance inform leadership? It takes combination of technique and improvisation. Building muscles and coordination. Dance leaders...are aware of the surrounding conditions, have focus and direction, embody and communicate rhythm and pace to their partners. Mature leaders know how to make their partners look good while inviting them to fully express...and even take risks. Brilliant leaders...focus on their partners while providing framing and direction. Supportive leaders...provide presence, clear signals, and appreciation. Graceful leaders...attend to limitations and engage the strengths of partners. 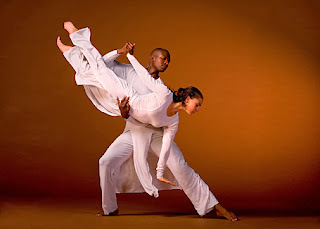 Conscious leaders are aware of surroundings and guides partners to open space where they can fully express their dance. Creative leaders...transform “missteps” into new choreography. Effective leaders...encourage and challenge partners to new levels of learning, skill and accomplishment. How do you invite, inspire and encourage others to dance with you? What skills or support to be a leader that dances? Need more reasons to dance? Hillary Clinton dances in Africa: Click Here (OK, she looks awkward...but that's when a true leader just has to be willing to go with the flow.